OK - so we need to update our pages... we would rather be torching! All said and done, Joy, Candy and I will have our beads at the "Southeastern Michigan Glass Beadmakers Guild (AKA, Glass Act) booth at Bead & Button. It's booth 1018. Joy and I will be manning the booth. We hope you'll come by and see us, especially our buddies from BeadFest Philly. Here is an e-ticket for one day entrance to the show. Show dates are June 6 - 8th at the Wisconsin Center in Milwaukee. 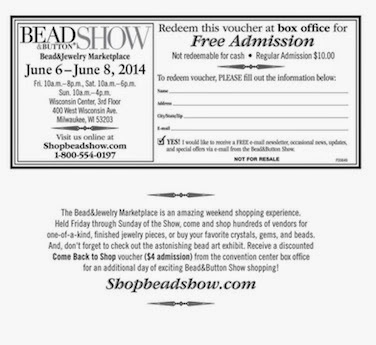 For more information, check out the Bead & Button Show link. Look forward to seeing you there!